Lyon Eats: You're Invited: ICCL Thanksgiving Party! 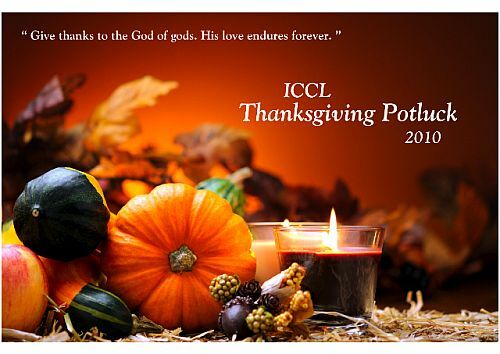 You are warmly invited to the ICCL annual Thanksgiving Potluck, a time of delicious food and great fellowship! What to bring: If you come with your family, please bring three dishes to share: a main dish, a side dish, and a dessert. If you’re coming by yourself or with one other, bring a dish of your choice. Drinks and silverware will be provided but please bring whatever utensils you may need to serve your food. To reserve for the event, visit the ICCL website here. There will be regular service at 4:30pm after the meal is over.